North Korea's threats of war have captured the world's attention in recent weeks, leaving citizens of other East Asian countries anxiously awaiting the latest news. A new war is unlikely, but how much do you know about North Korea, its international status, and its dispute with the south? Located on the northern half of the Korean Peninsula between South Korea and China (and sharing a short border with Russia), North Korea is a medium-sized East Asian country of about 24 million people. Despite its size, it boasts the fourth-largest army in the world, and has remained officially at war with South Korea since 1950. Sometimes considered one of the world's last remaining communist states, North Korea actually claims no longer to follow communist ideology. However, it surely does hold the distinction of having the world's most closed borders, with its totalitarian government tightly controlling the flow of information and people in and out of the country. What territory does North Korea claim? North Korea doesn't actually have "north" in its official name, which is the Democratic People's Republic of Korea (DPRK). This is because it claims to be the rightful government of all of Korea, including the south. South Korea (officially the Republic of Korea) also maintains the same claim, with both sides seeking eventual unification. Korea hasn't been a single independent country for over 100 years, since it lost its independence in 1905 and was absorbed into the Japanese Empire in 1910. How did Korea become divided? Armistice line and DMZ dividing North and South Korea. Modified by Evan Centanni from this map by Rishabh Tatiraju (CC BY-SA). When Japan lost World War II in 1945, Korea was divided temporarily between U.S. and Russian control, with the boundary placed arbitrarily at the latitude 38° north. However, the Russian-held area in the north and the U.S.-held area in the south ended up forming two rival governments, a political situation that culminated with the north's 1950 invasion of the south. In the first large-scale conflict of the Cold War, an American-led U.N. intervention force fought off the Russian- and Chinese-supported north in the three-year-long Korean War. 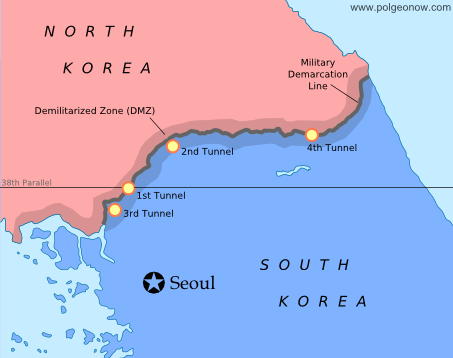 The armistice that brought fighting to an end in 1953 drew a new boundary close to the old one, but not as straight, also establishing a 4 km (2.5 mi) wide Demilitarized Zone (DMZ) around the line. However, because both Koreas seek reunification, neither recognizes the armistice line as an official border. 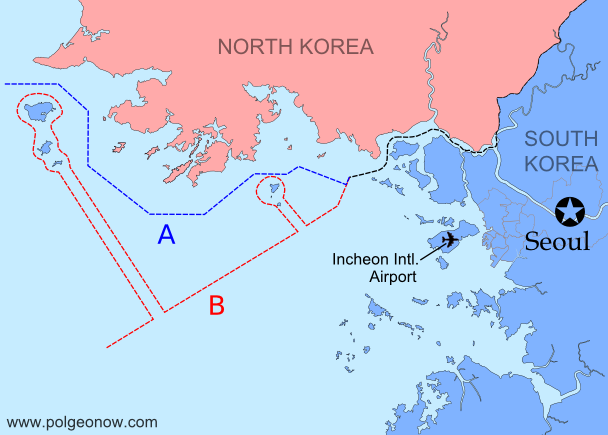 Korean boundary in the Yellow Sea: the U.N.'s Northern Limit Line (A) and North Korea's claimed line (B). Map modified by Evan Centanni from this one by Amble, 玖巧仔 and Tomchen1989 (CC BY-SA). Are there any other "disputed territories" between North and South Korea? 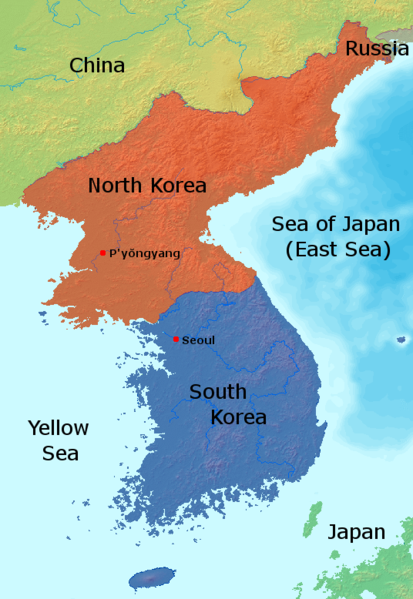 Yes - although technically the entire Korean peninsula is disputed between the north and the south, even the unofficial boundary is contested in the Yellow Sea off Korea's west coast. The armistice agreement didn't specify a sea boundary, and U.N. forces later drew a simple line running between North Korea and the nearest South Korean islands (the Northern Limit Line). However, North Korea has rejected this boundary, drawing its own line to carefully avoid the South's islands while claiming the surrounding waters for itself. What is North Korea's international status? Despite North Korea and South Korea claiming to represent the same larger Korea, they are both members of the U.N., after being admitted at the same time as Cold War politics were thawing in 1991. North Korea is now acknowledged around the world as an independent country, with only South Korea and Japan refusing to recognize it. Meanwhile, North Korea maintains active diplomatic relations with most of the world's countries, with a few major exceptions, such as the U.S. and France.